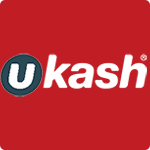 Ukash payment method is a very simple way to pay online that requires no bank account or credit checks; you simply need to have the cash in hand to go to a shop that supplies Ukash and purchase the voucher to use at an online casino or wherever you like online. It is a very safe way to pay as it helps you set yourself a limit and not overdo it, meaning you spend less than if you had the opportunity to keep on topping up from your personal credit card. This way of paying enables you to remain totally anonymous and not have to part with any details that could put you at the risk of fraudulent behavior. It is also so simple to use that anyone can use it even those with no experience online. Firstly you will need to purchase a Ukash voucher from your nearest store that stocks Ukash vouchers. The voucher can be worth whatever you pay for it, for example if you want to spend 100 euros at an online casino you simply hand over 100 euros and get a voucher worth that exact amount with no hidden costs whatsoever. You can then decide where you want to use it and simply sign up to the casino of choice that obviously supports Ukash as a payment method, and insert the 19 digit number into the space provided, if the online casino where you are playing does not support Ukash you can even use Ukash to top up your Neteller or Skrill e-wallet if you wish. The full amount of the voucher will then be added to your casino bank account for to play at your leisure. If you wish to use only a small portion of the voucher then you can choose to do so and will receive a new Ukash voucher by SMS, e-email or even directly on the screen to use whenever you feel like. This is a great way of controlling your cash especially when playing at online casinos. Most people will be more reluctant to have to make their way all the way back to the store to purchase a new Ukash voucher than they would be to use their credit cards to top up their online casino bank balance when they are on a losing streak! If there are no stores that supply Ukash vouchers in your area, you can always purchase the vouchers from online stores and use them in exactly the same way. Good luck!